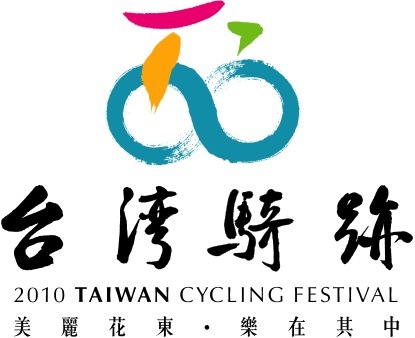 So, as detailed earlier, I was invited to attend the the 2010 Taiwan Cycling Festival, which officially took place from October 16 to October 24th. Taiwan’s government, with support from its cycling industry, has been working hard to promote itself as a bike-friendly tourist destination. Over the course of two weeks, I had a chance to see the results of these efforts first hand, and now that I’m (finally) back, it’s time to tell you about it. Taiwan, for those living in the United States, isn’t a short flight away. For me, it was a five hour flight from Washington to Los Angeles, and then another 14 hour flight from LAX to Taipei (TPE). From a US-based traveller’s standpoint, there’s a pretty steep initial cost to any trip to Taiwan: aside from the ticket itself, the 14 hours in a plane (minimum) and the resulting jetlag means that the destination has to be worth all that trouble. And Taiwan? Absolutely was. I was blown away by it. But speaking of blown away . . . The original plan for this trip was constructed, in large part, around the inaugural Taiwan Cup. The Taiwan Cup was designed to be a professional road race highlighting the and headlining a week of amateur racing and organized rides. 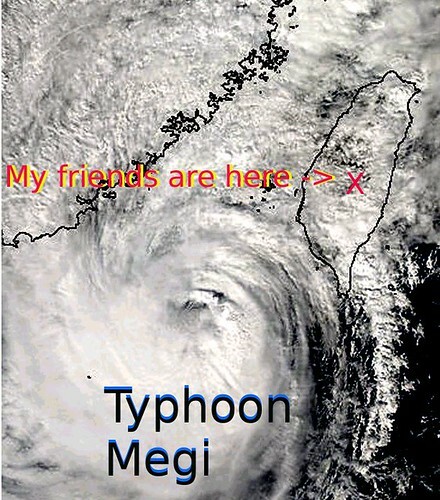 Unfortunately, Typhoon Megi changed these plans, not only forcing the cancellation of the Taiwan Cup, but also resulting in a number of casualties along the eastern coast of Taiwan. You can see a map with a bit more detail here. Thurs – Taipei. Straight from TPE to the hotel. There was, however, time for a walk. Friday – Taitung/Chihpen Hot Springs. Flew from Taipei to Taitung, toured some local markets, and maybe someone fell into the river while rafting . . .
Saturday – Chihshang. The opening ceremony for the Taiwan Cycling Festival, and our first day of cycling. It started with a short ride with Dr. Mao Chi-Kuo (毛治國), Taiwan’s Minister of Transportation and Communications. After that, we headed over to Taiwan’s first purpose-built recreational cyclepath in Guanshan, and then rode from there up to our hotel. Bonus: portaging was involved. Second bonus: an unexpected jazz concert. Sunday – Hualian. Knocked out a metric century (and then some) in the morning with an out-and-back along Highway 9, turning around at one of the markers for the Tropic of Cancer. Finished up the day in Hualian, where we got the first real hints of Typhoon Megi. 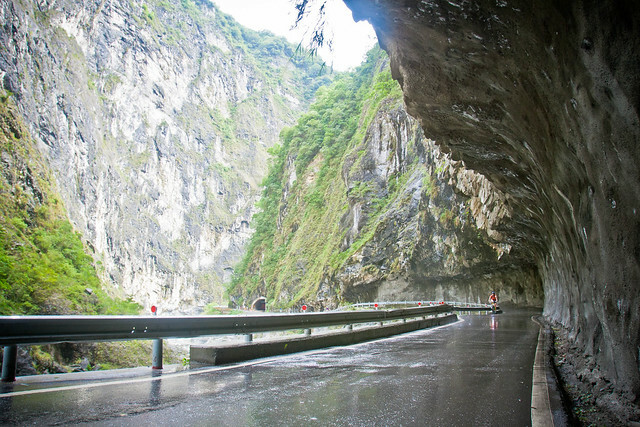 Monday – Taroko Gorge. Another AM ride, this time along the coastline in Hualian, in driving – but wonderfully warm – rain. We then headed back south to finish the day in one of the most breathtakingly beautiful places I’ve ever been. Tuesday – Taroko Gorge. 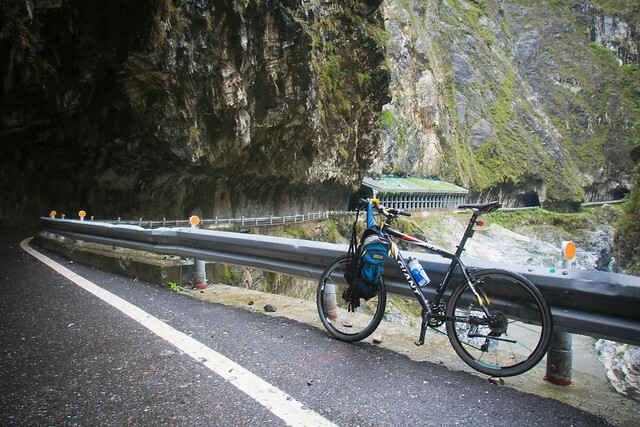 With a constant chorus of oh-my-god-look-at-that in my head, the day’s – and trip’s – highlight is climbing and descending through Taroko Gorge. Words will not suffice to describe this day. Wednesday – Taipei. Fly back to Taipei, hit some local bike stores, and end up at the one of the team hotels for the Taiwan Cup. Thursday – Taipei. Attend the kickoff press conference for the Taiwan Cup, interview three-time world champ Oscar Friere, and – by the end of the day – find out that the Taiwan Cup is almost certain to be cancelled. Instead of heading to Haulian to cover the race, we decide to head south. But not before visiting Taipei 101. Friday – Sun Moon Lake. While passing through Taichung, we visit factories for Giant and Mekkem. The day ends at Sun Moon Lake, a popular tourist destination (and, it turns out, where most of the pro racers end up). Saturday – Sun Moon Lake. Start the day with a ride around Sun Moon Lake with pros like Amets Txurruka. Enjoy a good chat on the road with Vicky Liu (劉麗珠), president of the Cycling Lifestyle Foundation, about the challenges of cycling advocacy in Taiwan. Sunday – Taipei. Late start to the day, which is mostly a road trip back to Taipei, where we reconnect with the rain. Did I mention the rain? End the day with a trip through an amazing night market. Monday – China Airlines Flight 8 to LAX. The longest Monday in my life (35 hours, I think). The day’s plan to go for a ride in Danshuei is foiled by more rain, so we end up on a lazy tour of the waterfront and local markets before heading back to TPE for the trip back to LAX. I leave behind new friends but take back a strong desire to return and share Taiwan with others. Sound interesting? Then check back daily. There will be words, photos, and even the occasional video. All of which I hope will show you what a wonderful place Taiwan turned out to be, and why I’ll definitely be heading back with my bike. Note: I’ve added a Taiwan category (see sidebar), so all of my posts related to Taiwan will be available here. That I’ve been utterly unable to stick to my plan to post daily about Taiwan isn’t just a testament to my ever present ability to overestimate myself, but also to the incredible amount of things we were able to see and do in Taiwan. I’m now in an LAX hotel (this would be hotel #14 in 15 days for me, I believe) and just beginning to sort out a plan for relaying what turned out to be one of the most incredible trips I’ve ever undertaken. From cycling through the natural beauty of Taroko Gorge to seeing the human faces behind the cycling industry, Taiwan blew right past my expectations. Stick around, if you’re interested in hearing more about it. Words are too much effort at the moment, so I went for a walk. After being asked by officials in Pasadena, Calif., if their city “was a dangerous place to bicycle,” Jacobsen began looking at crash data from various communities where bicycle ridership had fluctuated over time. What he found surprised him: The number of crashes involving bikes correlated with the number of riders in a community. As ridership fluctuated, so did the crash rate. More riders, fewer crashes; fewer riders, more crashes. This happened too abruptly, Jacobsen decided, to be caused by slow-moving factors like infrastructure development and cultural change. Bicycling becomes safer when the number of riders increases, he concluded, at least in part because the number of riders increases. 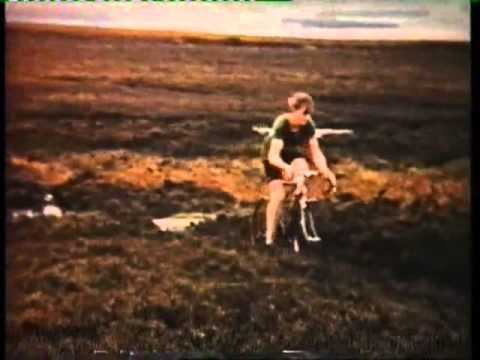 The more cyclists on the road, the safer we are. Read the whole thing. Today involved the first leg of my ~8,000 mile trip from home in DC to Taipei, Taiwan for the 2010 Taiwan Cycling Festival. 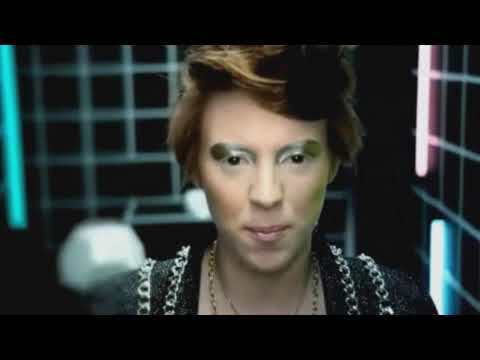 What is that, exactly? Err, I’ll find out the details when I get there. 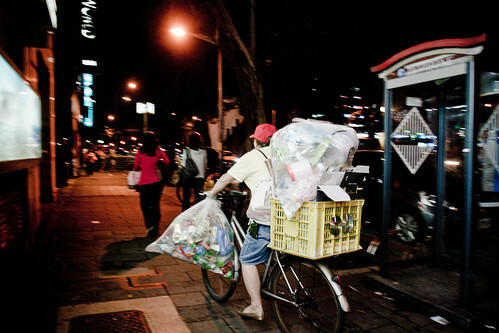 Taiwan is trying to promote itself as a cycling destination, and is hoping to use this event to showcase what it’s got. And, courtesy of the Taiwan Tourism Bureau, I’ll be giving you my take on the reality of that effort. I’ve been lucky enough to get around a bit, so I’m hoping that my well-considered take – which will be posted here over the next couple of weeks – will be useful to those thinking of trying Taiwan for a cycling trip. That trip, however, comes with a pretty steep initial cost for Americans. Nevermind the actual ticket cost, I’m talking about the 14 hour trip from LAX (can’t be much shorter from SEA or other northern US departure points) to Taipei (TPE). At 6’1″, and recalling my 14 hour LAX-SYD flight last year, I’m dreading it already. I did a 16 hour flight from Newark to Hong Kong some years back, and it was miserable. That said, Hong Kong turned out to be one of the most amazing places I’ve seen on this planet, and was absolutely worth those 16 hours. So while the price can be steep, it’s quite possibly worth it. We’ll see. Because I had zero interest in tying on the five hour flight from DC to LA into the LAX-TPE flight on the same day (for 19 straight hours of fun! ), I decided to skip out to LA a day ahead of time. My favorite local airport, National, doesn’t do much in the way of direct flights to LAX, so I had to head out to the airport I often mock – Dulles (IAD). It turns out that I might have to ease back a bit on knocking it. 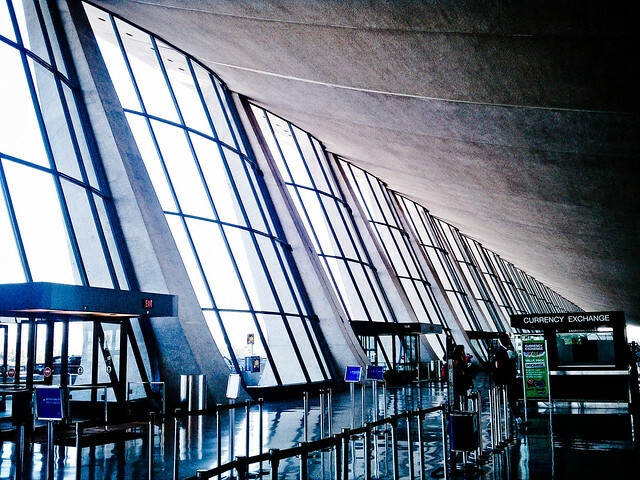 In fact, it came off as a perfectly nice airport – one that might even eventually live up to the promise of its Saarinen-designed ticketing terminal. First off, the moon buggies are mostly gone. In its place is a much improved security hall and rail transport to the terminals. 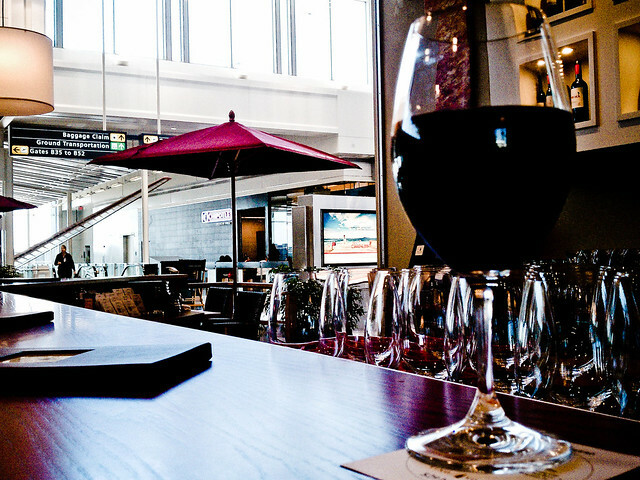 And much to my pleasant surprise, Vino Volo, previously accessible only on int’l flights, now has a (much bigger) location at Terminal B. Like ATL’s One Flew South, it’s a great wine bar with good food. Much better than the usual regret-inducing airport fare. The departure from my airport of choice also involved a departure from my airline of choice (Delta). This flight was on American, and since (in yet another departure from the norm) I’m actually checking a bag this trip (hard to pack clothing, cycling shoes/pedals, and a helmet in carry-on, it turns out), I experienced the joy of getting nickled ($25 for checked bag) and dimed ($39 for an aisle seat up front). (Too many parentheticals?) I don’t so much mind the total cost as the pettiness of dinging me for what I’ve come to expect as basics. We’ll just avoid the matter of food entirely. Personal thanks, though, to the flight attendant who took mercy on me and doubled my vodka tonic. So I’m at the LAX Hilton now. Did you know you can snag pretty much any of the standard airport hotels (Marriott, Hilton, Crowne Plaza) for ~$65/night on Priceline? I used to mock a friend mercilessly for using them (and I still mostly avoid them), but that’s a regular and reliable halving of the price anywhere else. 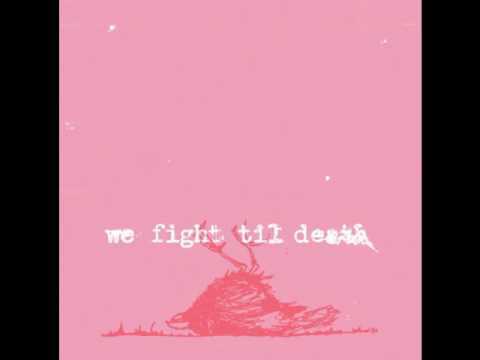 I’m trying to sort out a few more last minute things before I head off to uncertain connectivity, and then get a good night’s sleep ahead of what I’m sure will be something less than that. But I’m really really looking forward to actually being in Taiwan.